Alia Bhatt is requested to perform on Ghar More Pardesiya during a media interaction for Kalank and she does that without any retake. Actor Alia Bhatt has already garnered appreciation for her dance performance on Kalank‘s song titled Ghar More Pardesiya. The actor trained herself in Kathak for one year with Pandit Birju Maharaj before performing beautifully on the song. Now, she spread the same magic while promoting the film with her co-stars Varun Dhawan, Madhuri Dixit and Aditya Roy Kapur. 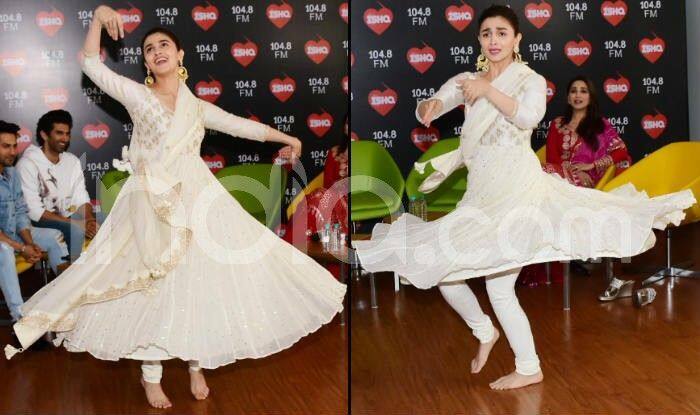 During a media interaction, she was requested to show her classical dancing skills and Alia did that without any retake. Dressed in a lovely off-white anarkali and big earrings, Alia broke into the jig and impressed everyone present there. During her flawless performance, Varun and Aditya constantly kept supporting and cheering for her in the background. This is for the first time that the actor has attempted a solo classical dance performance on-screen, and quite evidently, has excelled it. The video also features Madhuri alongside Alia. However, the Bahaar Begum of Kalank can’t be seen matching dance steps with the young actor in the frame. In fact, Alia recently revealed that having Madhuri not dancing with her on the song actually helped her perform better. She said that she can’t even imagine herself dancing with the stunning 90s diva in one frame. Kalank has another big song, expected to come out soon, that shows Madhuri’s solo number. Titled Tadap, the much-awaited big song has been choreographed by Saroj Khan. She opened up on the song in her latest interview with a daily and revealed that it is a relevant song to the narrative of Kalank. She said that Madhuri’s character Bahaar Begum performs magically when Varun’s character Zafar enters the kotha. Directed by Abhishek Varman, produced by Karan Johar and Sajid Nadiadwala, Kalank is slated to hit the screens on April 17.